Some of the best vacation spots in the world are located right here in the US! Read our list of the best US destinations to visit in 2019, below. 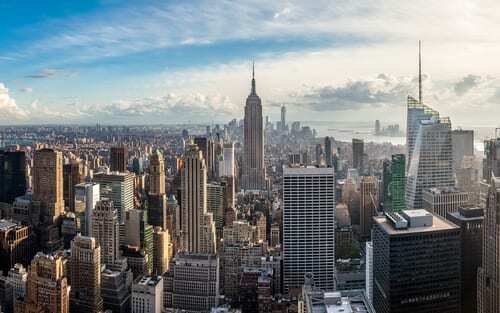 NYC is constantly at the top of our list of the best US destinations to visit, and 2019 it is even more popular. One thing that makes New York City the place to be, specifically in 2019, is World Pride, to be hosted in the city in June 2019. This is the world’s biggest LGBTQ celebration. In addition to the LGBTQ celebration, New York City will also honor the history of the city with the 50th anniversary of the Stonewall Riots. These riots took place in Greenwich Village, where members of the LGBTQ community pushed back against a police raid in a gay bar. This event marked a very important advancement and recognition of LGBTQ rights in the US. The 50th anniversary is a reminder to the entire world that NYC will always welcome people of every sexuality, race, background, and more. In addition these magnificent events, NYC is a city where you want to celebrate the classics. For instance, visit the Met while you are here or sample a seafood fast at the 42nd Street Oyster Bar at Grand Central Terminal. The Grand Canyon is one of the best US destinations to visit in 2019, and one of the world’s most magnificent natural wonders. It is also a UNESCO World Heritage Site. This year, in 2019, Grand Canyon National Park is marking its centennial anniversary. Most people visit the Grand Canyon by way of the South Rim, while the North Rim is closed for the winter. Both rims offer spectacular views and unlimited insta-worthy photo opportunities. For the more adventurous Grand Canyon visitors, you can hike to the bottom of the canyon. This takes about two days. Alternately, you can ride a mule to the bottom which is slower but definitely an easier option. Another option is to hike from the South Rim to the North Rim (when in-season). This trek will take about three days. For an even more adventurous option, book a two week rafting trip from one rim to the other. No matter what your adventure level, you should make time to the hike the Bright Angel Trail to Indian Garden. As far as US destinations go, Hawaii is probably one of the most beautiful in the entire country. Though the eruption of Kilauea in May 2018 put a damper on tourism, the island of Hawaii is now restore to its magnificent beauty and welcoming guests as usual. Even the Hawaii Volcanoes National Park, which closed during the Kilauea eruption for obvious reasons, has been mostly all reopened in late September. The trails and other attractions here are completely safe and welcoming tourists. If you do decide to visit the National Park, don’t miss Volcano House. Located in the park, Volcano House reopened in early November. Here you will find amazing star-gazing and volcano views. Are you ready to explore outer space? In Space Coast, Florida, space fans can still explore the heavenly skies on a trip to the Space Coast. To make this place even more special in 2019, the 50th anniversary of mankind’s first walk on the moon will be July 20 of this year. Central Florida’s Atlantic shoreline is ready for the throngs who want to see where Neil Armstrong, Buzz Aldrin and Michael Collins rocketed off the Earth and into the history books. Call us today at 402-390-9291 to book your own getaway to one of these top US destinations.